The weather was bright and warm, the vines were budding, the views were magnificent and, of course, the wines were delicious! 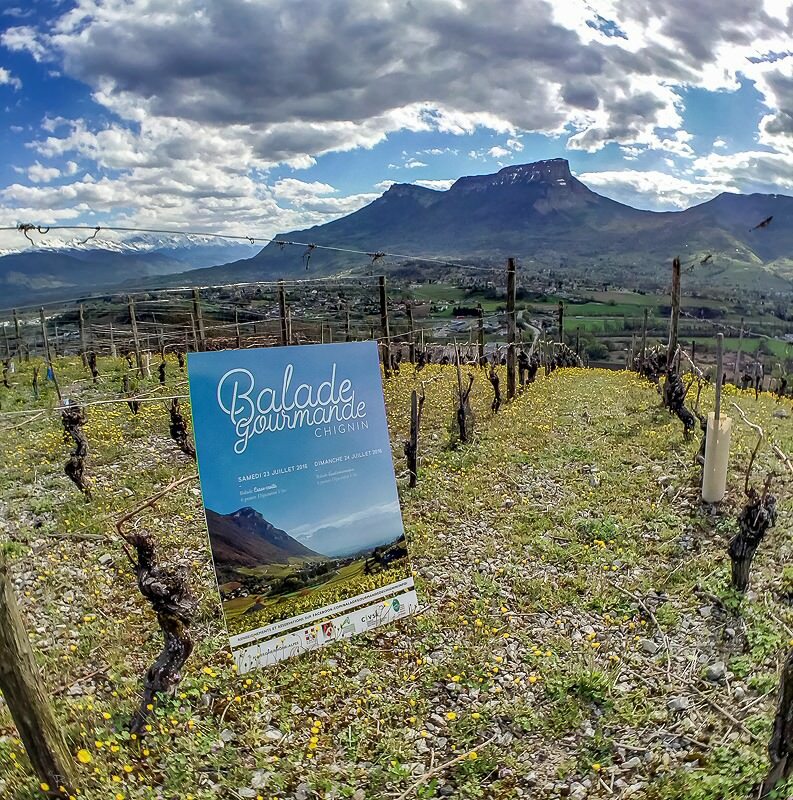 We had been invited to Savoie to learn more about the walk in the vineyards of Chignin, La Balade Gourmande de Chignin, which will be held over the weekend of 23rd and 24th July 2016. Three years ago, on a glorious sunny day, we enjoyed the Balade Gourmande in Abymes on the other side of the valley in the lee of Mont Granier. Another tower and a handsome house in the vineyards with a backdrop of the Belledonne mountain range in the south west. In July the vineyards will be verdant green but there may just be some snow on the mountain tops in the distance. Now in its eighth year this event has always been popular and this year will be held over two days. 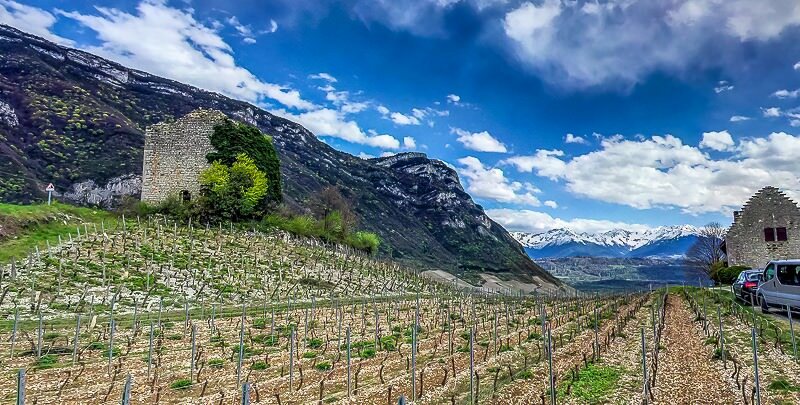 Each day there will be an eight kilometre walk in the vineyards, punctuated by stops where the hikers can enjoy the local wine as well as Savoie food. 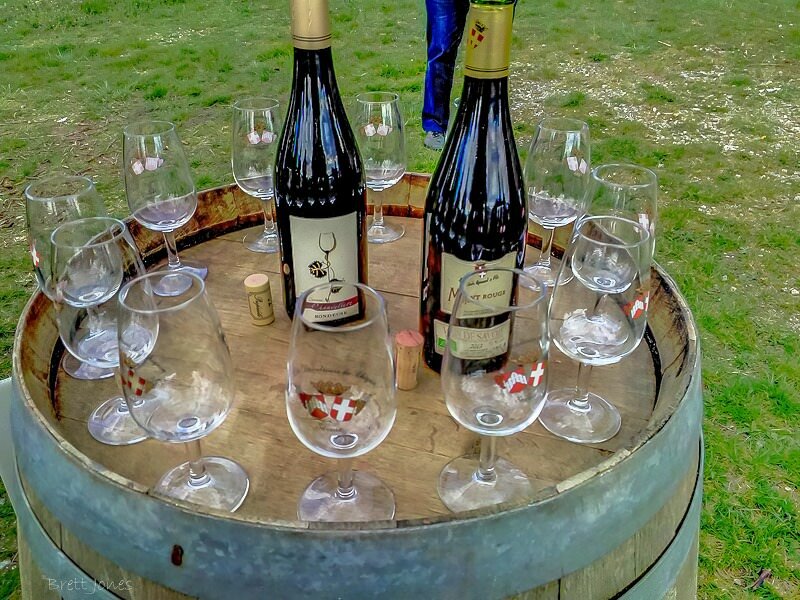 It is a lovely way to explore wine country and get the feel of a particular region. The Saturday will be a lower key occasion with simpler food on offer at three stages, whereas on Sunday there will be six stops where more gourmet-style dishes will be accompanied by matching Chignin wines. Prices: Saturday €25 per person; Sunday €45 per person; on both days €10 for children under 10. You can learn more on the Balade Gourmande de Chignin Facebook page. You can buy tickets for your walk in the vineyards from 20th May. Here are my photos of an early spring day in Chignin. 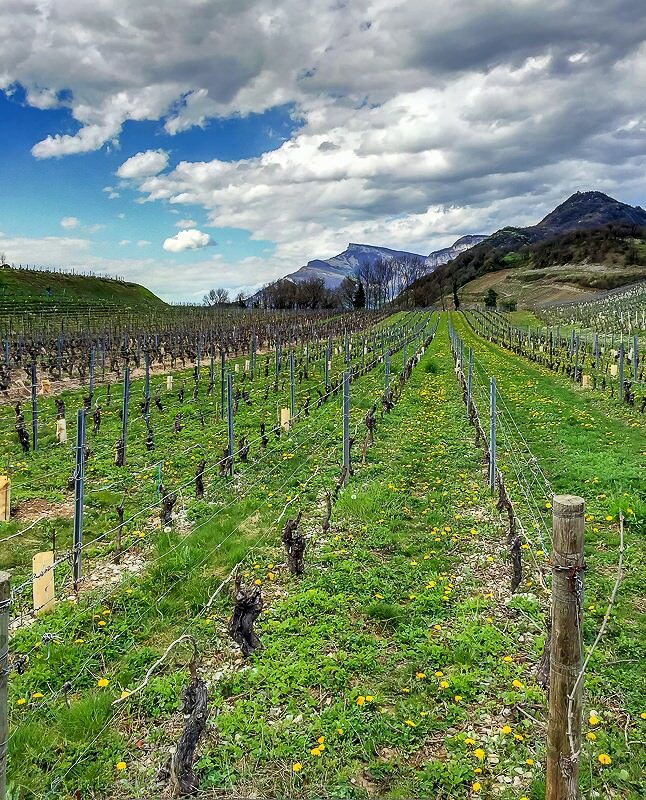 Learn more about the Savoie wine region and its wine styles. Using the local synonym Bergeron (interestingly, a variety of apricot particularly grown in the Rhône valley) Roussanne is planted in Savoie only in Chignin and neighbouring communes and in a few IGP (Vin de Pays) areas. Chignin-Bergeron is a cru in its own right and the wines are always 100% Roussanne. When planted on sunny south-facing rocky slopes it produces very ripe grapes and chaptalization is rarely required; there is usually somewhat more acidity than found in the Rhône, but with similar yellow fruit flavours. 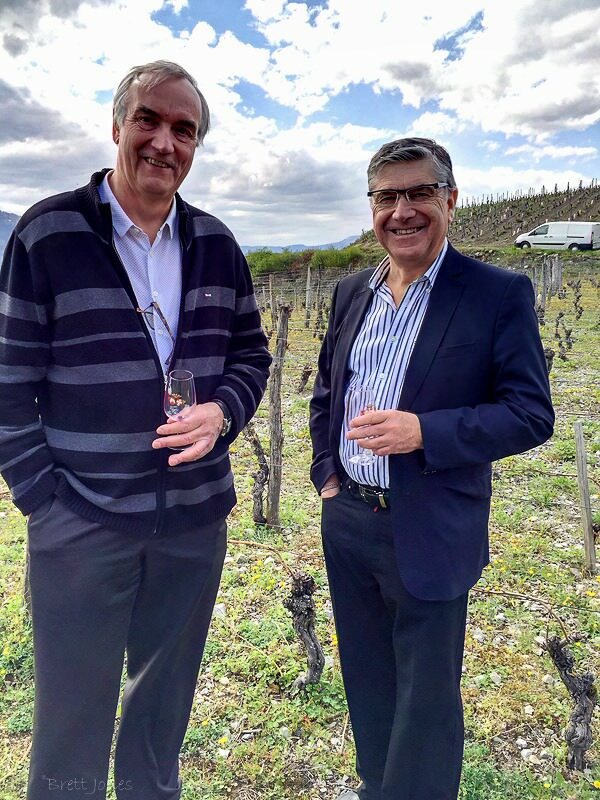 Thank you to our hosts Michel Quenard, président du Syndicat des Vins de Savoie, Charles-Henri Gayet, président du Comité Interprofessionnel des Vins de Savoie and their hard working Savoyard colleagues! 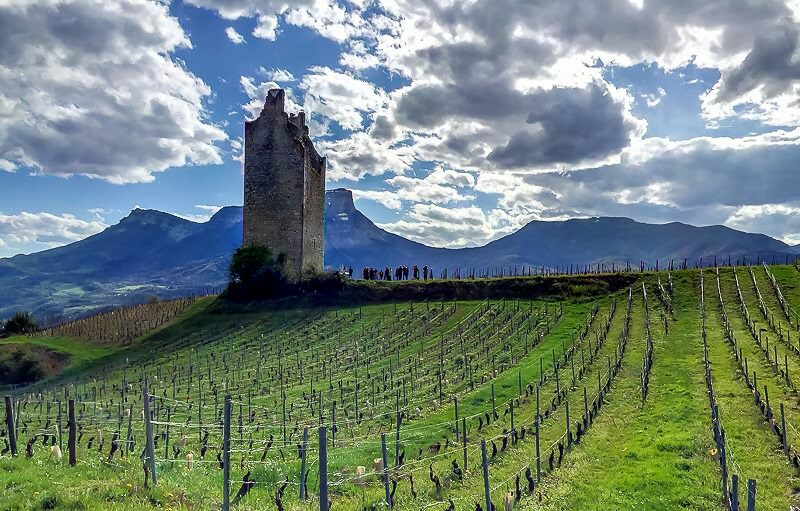 This entry was posted in Travel, Wine, Wine Blog and tagged Abymes, Balade Gourmande, Balade Gourmande de Chignin, Belledonne, Chignin, Chignin Bergeron, CIVS, Mont Granier, Savoie, Wine Travel Guides by Brett, the Wine Maestro. Bookmark the permalink.